At the same time as our national psyche awakens to the urgent dangers of plastic pollution, does it not seem entirely bizarre that the fashion trend for PVC clothing and accessories is booming for spring 2018? It dawned on me upon seeing countless street style pictures featuring key designer pieces rendered in clear and colourful plastics. 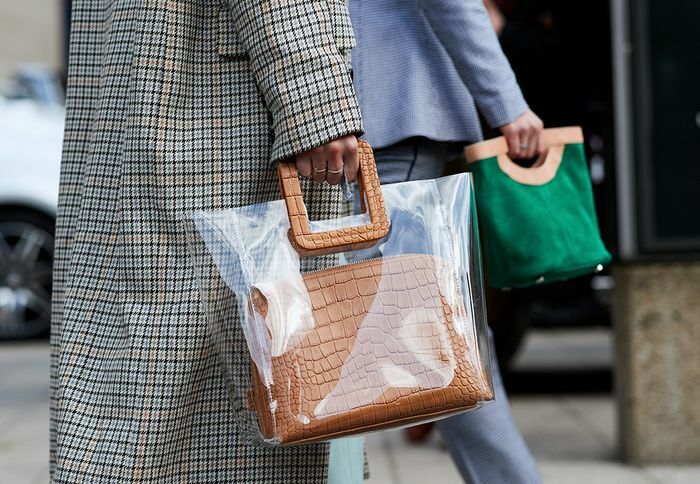 The stats surrounding the trend back up my observation: Fashion search engine Lyst informs me that Staud's £175 PVC and leather Shirley bag has been searched for over 3000 times this past fashion month. It's been a firm fixture on the influencer and editor circuit, and we too can appreciate it's aesthetic qualities, for sure. Similar story when it comes to Off-White's collaboration with Jimmy Choo, where some new shoe styles are flourished and wrapped in a TPU overlay: Searches have increased by 40% month on month, with a 14% rise in sales for those particular pieces during the same period. Cult Gaia's plastic earrings have been looked for two and a half times more than their wildly popular basket bags this year. Calvin Klein 205W39NYC's plastic-coated checked overcoat is one of the brand's most-viewed coats in the whole collection. You get the idea. I’ll put my hands up quickly. We have featured some of these new and desired buys in our daily purpose to bring you a real-time download on what’s happening in fashion. The trending items previously mentioned all come with a higher price tag and therefore one could assume a potentially deeper level of conscious decision-making, but as the trend evolves, it will surely hit the high street—a prospect that seems even more daunting. Whilst the biggest culprits of plastic pollution lie within the food industry (and particularly the world of plastic bottles—read more on the overall environmental impact here), fashion's adoption of this fabric "is quite surprising considering the rate at which public concern about plastic pollution is growing around the world," explains Trisha Brown, Greenpeace Oceans Campaigner. "Of all the different types of plastic in the world, PVC is the most environmentally damaging. PVC production facilities generate hazardous chlorinated wastes, some of which are inevitably released into the surrounding environment. Plus PVC often contains toxic additives such as phthalates, many of which are toxic to wildlife and humans, and known to be capable of causing changes to both male and female reproductive systems in mammals." What you do need to understand is that it isn't the novel purposefully plastic items that pose the biggest threat—the larger issue in this industry is twofold and somewhat hidden. "There is the basic issue of plastic pollution in fashion that happens in the supply chain, as most big retailers and designers send every single piece of clothing protected within plastic," says Cora Hilts, co-founder of the sustainable luxury fashion e-commerce site Rêve En Vert. "We consume billions of pieces of clothing annually—think about how much packaging that adds up to alone. Then you have the deeper issue of the fact that plastic is found in so many materials and fabrics within fashion. I think most consumers would be shocked to learn that a vast majority of fashion—for instance anything that is made with polyester, nylon or rayon or organza—is simply plastic. This substance forms the basis of quite a few luxury products, even when it’s less obviously marketed." Trisha concurs: "We think that plastic pollution from clothing, especially from microfibres, which can be released in their thousands during a single wash of a polyester garment, is as significant as factory chemical discharges and the energy resources used during the manufacture of clothing. But it is possible to tackle these challenges and to ensure that the environmental impact of clothing production is minimised. This is something that designers like Stella McCartney are trying to achieve by joining the Ellen MacArthur Foundation's call for a circular textiles economy." Innovative fast-fashion brands such as H&M (who is known for its sustainability efforts) are also putting time and money into researching fabrics that are less tied to the necessity of plastics as a base. This story, of course, raises the debate about what exactly is a good alternative—not to mention the many other harmful practices in action. Cotton farming can be blamed for water waste, agricultural pollution and so much more. Leather is becoming less favourable due to a rise in veganism, but vegan leather is derived from plastics. The use of fur is protested endlessly. Fast fashion is derided for what it promotes. Luxury fashion isn't exempt from unsustainable practices either. "When choosing a new item, it's good to think about its manufacturing footprint, its packaging, how durable it will be and how long you're likely to want to keep using it," says Trisha, suggesting that you skip the plastic trend altogether and focus your plastic-saving efforts elsewhere with refillable coffee cups and water bottles. These are two really key ways we can all "play a part in reducing plastic pollution." Cora agrees but notes that there are some interesting moves being made to recycle plastics in the fashion industry: "At Rêve En Vert, we are looking into our designers doing incredible things with plastic like breaking down plastic water bottles and remaking them into things like yoga pants (Teeki and Yoga Democracy) or creating entirely new fabric that doesn’t shed microfibers or, yes, any plastic to create elasticity (S Dress). These lines don’t follow the exact trend but do address this issue in an innovative way." Despite our trend-hunting ways, at Who What Wear we are true advocates of investment pieces and fully stand behind the importance of crafting a personal style to last a lifetime. I could say you don’t need this trend, and that you could survive without new clothes or bags or shoes for the foreseeable, but what we all should do more of is consciously watch and improve our shopping habits—whether we're talking about this trend or any other. For more information see the Greenpeace.org.uk website and their Plastics Pledge.